Parasound launches Halo Integrated 6 stereo amplifer | What Hi-Fi? This 160W class A/AB amp uses meaty 1.1kVa transformer and dual-mono power supply. 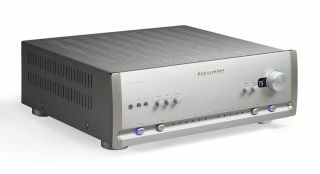 It features the same headphone amplifier section, balanced XLR connections and direct input (that bypasses the pre-amp section) as the Halo Integrated, but you'll also find a number of upgrades under the hood. The Integrated 6 boasts a dimmable display, volume level memory and an extra optical input, but the biggest change is the inclusion of a new Burr-Brown analogue volume control, which replaces the motorised potentiometer of the original. But the tweaks don't end there. The DAC stage has been redesigned, while Parasound also claims that the phono stage has been improved. Like the original amp, the Halo Integrated 6 includes variable loading for both MM and MC cartridges, an asynchronous USB 2.0 input with comprehensive high-res audio support, and a multitude of analogue inputs for connecting external kit. The Parasound Halo Integrated 6 is on sale now for £3300.